8 Spudman.com Worleys keep the operation in the family for years to come By Bill Schaefer CONTRIBUTING WRITER Photos by Bill Schaefer BOB MATTIVE SHARES THE HISTORY OF WORLEY FARMS ON SPUDMAN.COM W hat to do with the farm? That's a question facing many farm owners these days as they approach retirement: to sell the acreage and assets or to pass them on to the next generation, if there is a next generation waiting for the opportunity. Whether you call it transition planning or succession planning, the two topics have become a frequent subject of conversation wherever farm families gather. The Worley family began addressing their succession plans in 2017. 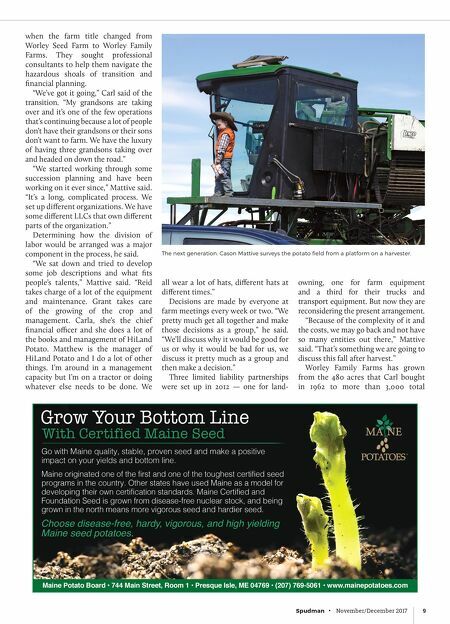 The Worley name has been a part of the San Luis Valley (SLV) farming community since 1919 when Gerald Worley convinced his three brothers and their parents to move their farming operation from Keokuk County, Iowa to Colorado's San Luis Valley. Gerald's son, Carl, grew his first potato crop as part of a Future Farmers of America project in high school. Upon Carl's return from the Korean War in 1954 he jumped right back into potato farming with his father and never looked back. In 1962 Carl purchased three quarter sections, almost 480 acres, in the townsite of Mosca in the SLV and started Worley Seed Farm. Today there are three generations of Worleys farming in the SLV. Carl, 87, is semi-retired but continues to help when called upon. His daughters, Carla Worley, Gail Mattive and son-in-law, Bob Mattive, are the general partners in Worley Family Farm LLP., Carl's grandsons, Matthew Smartt, 35, Grant Mattive, 32, and Reid Mattive, 28, are three future partners in the LLP and are buying out the farm interests of Carl's three other daughters, Annette, Carrie and Yvonne. 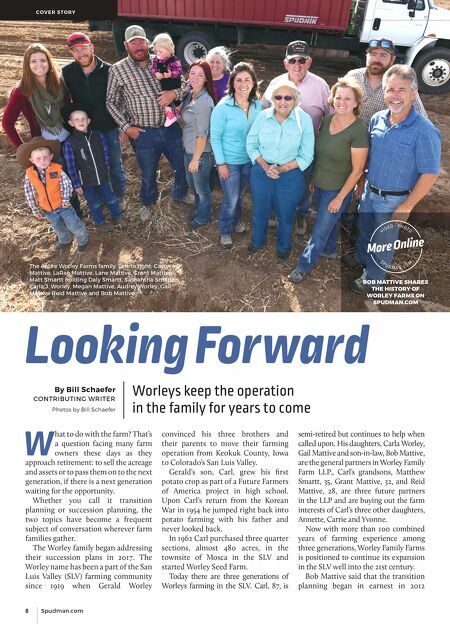 Now with more than 100 combined years of farming experience among three generations, Worley Family Farms is positioned to continue its expansion in the SLV well into the 21st century. Bob Mattive said that the transition planning began in earnest in 2012 Looking Forward C O V E R S TO R Y The entire Worley Farms family. Left to right: Cason Mattive, LaRae Mattive, Lane Mattive, Grant Mattive, Matt Smartt holding Daly Smartt, Samantha Smartt, Carla J. Worley, Megan Mattive, Audrey Worley, Gail Mattive Reid Mattive and Bob Mattive.